Jeffery, J.V., & Wilcox, K. (2014). ‘How do I do it if I don’t like writing?’: Adolescents’ stances toward writing across disciplines. Reading and Writing, 27(6), 1095-1117. Stories matter. Stories are how make sense of the world and my place in it. I don’t much care if the story is fiction or nonfiction; I believe one can learn as much about human capacity, and about oneself, from a made-up story as from a story “ripped from the headlines.” I was in the 10th grade when I decided for certain that stories, even fictional stories, were sources of understanding about the very real world. Mrs. Rubin assigned The Great Gatsby. Dutifully, I read it. Somewhere in the middle I shifted from doing homework to admiring the naive hopefulness of a person’s insisting he could ignore the objective origins of his life and concoct a preferable one, and mourning the hopelessness of doing so, and ruing the sucking undertow of improvident provenance. In addition to learning this lesson–which, I would guess, some unfortunate people learn the hard way–I also learned that there was some sad mystery I didn’t yet get underlying Daisy’s heartbreak at bearing a girl and hoping that she’d be a beautiful fool. I learned that assigned reading had the power not just to amuse but to astound me, and that the people who wrote the fictions had the most power of all. 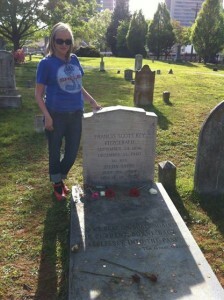 F. Scott Fitzgerald is buried in the graveyard directly across from my high school–probably a third of a mile from Mrs. Rubin’s classroom, as a crow flies. Even dead, supposedly having rolled under the major road because of soil erosion, he was making a 15-year-old girl feel wise and weepy. Like I said, power. 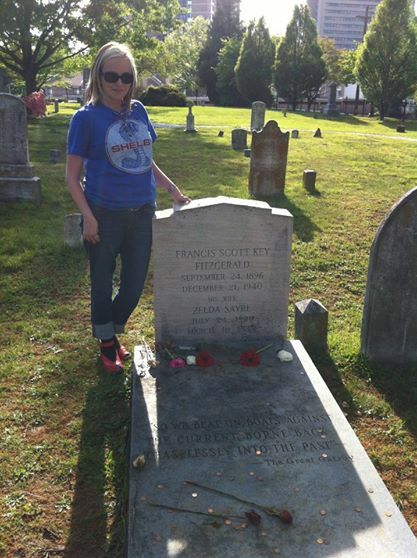 “So we beat on, boats against the current, borne back ceaselessly into the past.” F. Scott Fitzgerald’s grave in Rockville, MD. A source of mock-tension between me and my father, a scientist by both occupation and temperament, is this disagreement: I say stories matter; they may be all that matters. For him, “reading is done with the objective of acquiring needed information or to find the answer to a question or solve a problem” (C. Avery, personal communication, June 15, 2014). Despite this disagreement, we both love to read, and we both love to write. He does value stories (how else would I know that he dreams in black and white, except for a red barn?) and, as the author of E. Francis Baldwin, Architect: The B&O, Baltimore, and Beyond (available here), histories. It is so sweetly fitting that I am now a 10th-grade teacher, and I have the opportunity to introduce my students to the books that will awaken them the way The Great Gatsby did me. When I entered this doctoral program (five long-seeming weeks ago), I thought (knew?) that I wanted to study writing instruction. My fuzzy idea, way back then, was that I wanted to better understand students’ attitudes toward writing, why they seemed to behave (and write!) so differently when they perceived a writing assignment as “creative” versus “academic” (air-quotes because I refuse to accept that any writing is any thing but creative). What I didn’t know until two nights ago was that stories (the telling, writing, and studying of them) could be not only the subject matter of my research but also the (or a) method of my research as well. I’m talking about discourse analysis, or “the study of language in use” (Souto-Manning, 2014, p. 203). A cross-disciplinary study braiding together linguistics, sociology, and anthropology (Souto-Manning, 2014, p. 203), discourse analysis in its current state focuses on language as a means of exploring “socially created ideas and things in the world as well as their maintenance over time” (Souto-Manning, 2014, p. 203). Discourse analysis isn’t a fancy word for sentence-diagramming (though it does entail some elegant ways of presenting conversational elements in graph form, and I love sentence-diagramming, as well). Discourse analysis is based on the idea that language, this ordinary thing we use every day, a tool so clumsy even babies use it, is all bound up in power. According to James Paul Gee (2011), “when we use language, social goods and their distributions are always at stake” (p. 7) Consider, for example, my insistence that my students address me as “Ms.,” not “Mrs.,” Decker. The absence of that little lowercase “r” indicates that I do not believe that a woman should have to announce her marital status to colleagues or associates, especially when her male coworkers are not expected to do so; I signal that my marital status is immaterial to my function as a professional. I reject previous decades’ traditions. I announce myself as a feminist. It is personal and it is political. But, according to Gee (2011), “language is always political in a deep sense” (p.7). Discourse analysis can be concerned with the content of people’s communications, the grammatical construct of their communications, or both (Gee, 2011, p. 8). So yes. Stories matter. Language matters. The language we choose doesn’t just reflect our reality; it helps to construct our reality. For the last few days, I’ve been working to acquaint myself with empirical studies that use discourse analysis. The one I’m going to look at more closely here is very much like the kind of thing I entered this doctoral program thinking I’d like to do. I will walk through the design, data-collection, and discussion of the study and then discuss what it suggests for educators in general as well as what it suggests for me as a neophyte researcher. The authors of this study wanted to know if and how students’ attitudes and feelings toward writing varied depending on what course or school subject they were writing for. Secondly, they wanted to know whether these feelings or attitudes varied according to the students’ proficiency and performance as writers (Jeffery & Wilcox, 2014, p. 1100). Jeffery and Wilcox (2014) make several observations that suggest that their research is both relevant and timely. First of all, the authors point out that the widely adopted but highly controversial Common Core standards emphasize student engagement in “a variety of advanced disciplinary writing tasks” (Jeffery & Wilcox, 2014, p. 1095) while simultaneously acknowledging that “a majority of US students are not adequately developing their [writing] abilities prior to high school graduation” (Jeffery & Wilcox, 2014, p. 1096). They don’t need to say much to make a compelling case: we hear over and over how crucial writing skills will continue to be for our students’ futures, and yet we all see daily evidence of their profound struggle with writing. I’m sold. First, the authors acknowledge that while much research has been performed to examine “college-level writing, less is known about variation in writing expectations in secondary school subjects, particularly in subjects other than English language arts (ELA)” (Jeffery & Wilcox, 2014, p. 1098). Secondly, and crucially, the authors point out that existing research into student writing has been largely limited to standards-based outcomes as opposed to students’ own stances toward the writing and their self-concept as writers (Jeffery & Wilcox, 2014, p. 1097). Jeffery & Wilcox (2014) argue that “how [students] feel about writing and how they perceive their knowledge of writing have been found to be related to performance on writing tasks” (p. 1096). Jeffery and Wilcox (2014) state emphatically that there is a “dearth of research regarding adolescents’ perceptions of writing across disciplinary contexts” (p. 1098). The authors of this study are very concerned with student agency as defined by Ahearn (as cited in Jeffery & Wilcox): “the socioculturally mediated capacity to act” (p. 1096). That is, the authors wanted to know how students felt about themselves, their abilities, and their capacities as writers. Given the overwhelming reliance on “standards-based outcomes” (Jeffery & Wilcox, 2014, p. 1097), student agency has been overlooked in the research. These authors are less concerned with writing success as measured by standardized tests than with “the extent to which students perceive disciplinary writing tasks as opportunities to transform knowledge . . . and become invested participant[s] in the work of the discipline, as opposed to being constructed as the subject of such work” (Jeffery & Wilcox, 2014, p. 1097). There it is again: power. In this case, who do students perceive to have the power to make them good writers? Themselves? What power do they have as writers–is their power limited to the power to report others’ ideas, or are they empowered, as writers, to make original ideas? The authors convincingly establish that there is a hole in the research. It’s hard not to agree with their claim that while the nation wrings its hands over Common Core and high-stakes tests, no one’s asking kids themselves how they approach writing, how they feel about it, and what we could do to help them write better. I am always inclined to get on board with a pro-student stance like the one these authors take. Jeffery and Wilcox (2014) operate on trio of theoretical givens: first, they subscribe to “constructivist learning theories, which reject notions of literacy as a static collection of predetermined skills that can be acquired through rote and isolated practice or fully captured in a decontextualized writing event such as a large-scale standardized assessment” (Jonassen & Land, 2000, as cited in Jeffery & Wilcox, 2014, p. 1096). Secondly, they predicate their study on prior writing research that “suggests students’ stances [toward writing] are not fixed but rather are highly susceptible to change over time and across settings (Jeffery & Wilcox, 2014, p. 1096). Thirdly, Jeffery and Wilcox (2014) rely on prior research that suggests that “writing competence is not a monolithic construct individuals automatically transfer from one disciplinary setting to another, but rather is socially co-constructed by individual and disciplinary discourse communities within which they write” (p. 1098). In sum, then, the authors presume that students can be and are literate in ways that schools don’t always honor or value; students feel differently about writing depending on where, why, and for whom they’re doing it; and all people redefine their identity and capability as writers each time they engage in a new writing opportunity. Given these premises, it makes sense to use discourse analysis for this study. What’s being sought is qualitative data about students’ attitudes toward writing, not empirical data reflecting their skill Analyzing the way they talk about writing is really the only way to get at this information. This particular study is embedded within the National Study of Writing Instruction, “which investigated the teaching and learning of writing in middle and high school settings across California, Kentucky, Michigan, New York, and Texas” (Jeffery & Wilcox, 2014, p. 1100). The larger study relies on interviews, surveys, field observations, and samples of student work (Jeffery & Wilcox, 2014, p. 1100). That larger study recruited both 43 English learners and 95 native speakers from 10 schools in the aforementioned states (one middle school and one high school from each state) (Jeffery & Wilcox, 2014, p. 1100). Schools were targeted for inclusion that “served larger-than-average populations of low-income students and had above-average literacy achievement outcomes compared with schools serving comparable demographics” (Jeffery & Wilcox, 2014, p. 1100). Furthermore, the researchers sought schools with “a demonstrated commitment to implementing school-wide literacy initiatives” (Jeffery & Wilcox, 2014, p. 1100). Some aspects of that recruitment criteria give me pause: For one, the authors themselves reject standardized tests as the measure of student proficiency in literacy, yet they use that very data to locate the schools with above-average literacy outcomes. Secondly, they performed their research at sites that, it could be argued, were already doing writing instruction (comparatively) well. My hunch is that student stances toward writing would be at least as telling at sites where writing instruction isn’t going so well. However, the authors are careful to acknowledge and explain their reasoning, stating that they were looking for “exemplary practice as opposed to status quo or weak practice” (Jeffery & Wilcox, 2014, p.1100). I maintain that a parallel discourse analysis of schools with weak practice would be hugely beneficial. The data collection method for this smaller, embedded study was interview. Interviews were conducted by National Writing Project staff near the end of the school year and were based on a 7-question interview protocol that invited participants to reference, wherever possible, a portfolio of the student’s work from that school year. Interviews lasted approximately 45 minutes (Jeffery & Wilcox, 2014, p.1101). The interview protocol, provided as an appendix to the article, was hugely helpful. The questions were open-ended but substantive, and the number and type of questions seemed appropriate for both high school and middle school students (that is, they left room for students to be as abstract and self-reflective as their maturity would permit) (Jeffery & Wilcox, 2014, p. 1113). Interviews were then reviewed, parsed, and graphed on a stance matrix to organize them. Organizing the students’ communications in the stance matrix meant rearranging their syntax and, at times, inverting word order so that student responses could be compared side by side (Jeffery & Wilcox, 2014, p. 1102). Data was triangulated among researchers to ensure validity. I would have preferred more tables, as I am very visual. If there were phrases or words that came up time and again, I would have liked a list of those coded by their frequency of utterance. Of all the positive stances toward writing, 74% were about writing in English language arts (ELA) settings (with 14% for social studies, 9% for science, and 3% for math) (Jeffery & Wilcox, 2014, p. 1103). Of all the negative stances toward writing, 44% were about writing in ELA settings (with 18% for social studies, 19% science, and 9% math) (Jeffery & Wilcox, 2014, p. 1103). The authors argue that the fact that students generated more responses of both types, positive and negative, toward writing in ELA settings is attributable to their simply doing most of their writing there. Students tended to characterize ELA writing as “allowing latitude for ‘voice’ and ‘opinion’; whereas they tended to characterize writing in other subjects as limited to ‘facts’ and ‘accuracy'” (Jeffery & Wilcox, 2014, p. 1104). As for a revelation that wouldn’t come from a purely quantitative study, discourse analysis revealed that students frequently “used language suggestive of capacity (e.g., ‘room,’ ‘space’), signaling their sense of agency” (Jeffery & Wilcox, 2014, p. 1104). Correspondingly, students associated negative writing experiences with rigidity, constraint, and rules (Jeffery & Wilcox, 2014, p. 1105). Students of both achievement levels, at all grade levels, “were united in their preference for writing involving subjective engagement, which they were more likely to associate with their ELA classes” (Jeffery & Wilcox, 2014, p. 1106). However, students of lower achievement levels “expressed stances only toward extended writing in ELA, implying that they were asked to produce little if any such writing in other classes” (Jeffery & Wilcox, 2014, p. 1108). I must point out that this sentence makes me crazy. The “only” appears to be misplaced, obscuring meaning. To be consistent with what I believe their intended meaning to be, the sentence should read as follows: “[Students] expressed stances toward extended writing only in ELA”–that is, they did not express these stances toward extended writing in science class. As written, a possible meaning is that the students in question expressed stances toward extended writing exclusively and not toward other kinds of writing (in ELA classes). Higher-achieving students were more likely to point out that classes other than ELA offered opportunities for subjective, knowledge-making writing as opposed to rote repetition of facts and figures. Students at lower levels of achievement did not really broach the idea that ELA offered room for opinions, and other classes did not (Jeffery & Wilcox, 2014, p. 1109). The authors attribute this finding to the fact that at lower levels of achievement, students are not required or invited to do much writing in classes other than English. Therefore, for these students, writing in ELA means essays and personal narratives, whereas writing in math and social studies means worksheets (Jeffery & Wilcox, 2014, p. 1108). This is an alarming finding (more on that later). Leon, a sophomore, said his favorite writing assignment was a “uniform position paper” written for ELA because he got to take a stand and argue for it. Leon also declared, “I love school” (Jeffery & Wilcox, 2014, p. 1107). Incidentally, Leon was coded as one of the lower-achieving students. Joe, one of the higher-achieving sophomores, named an essay on A Doll’s House as his favorite assignment because he “got to analyze” (Jeffery & Wilcox, 2014, p. 1106). Katy, an eighth-grader, was most proud of a story she wrote after reading The Diary of Anne Frank,saying that she was “proud because of that piece because I felt it was the closest I could get to the character. I did a lot of research and understood a lot more” (Jeffery & Wilcox, 2014, p. 1108). Katy’s comment suggests that the kinds of writing students prefer can also lead to the kinds of writing generally thought to be rigorous and demanding. Interestingly, Katy named her least favorite assignment as a creative-sounding math assignment in which she had to design a comic book to explain a math concept to a second-grader. At first, this seems surprising, and I feel empathy for that poor math teacher who probably thought she was giving the kids just what they wanted (comic books! In math! Creative!). My interpretation is that Katy didn’t enjoy it because it had the trappings of creativity without affording her the chance to discover something new, by way of either self-reflection or research. This study also suggests that students and (some) teachers are aligned on another belief, even if they don’t declare it outright: Writing is supposed to happen in English class. Anywhere else is a stretch at best, an outrage at worst. One of the lower-achieving student participants was quoted as saying, “I’m pretty sure good writing is the same for all classes. They don’t talk about writing in history or science” (Jeffery & Wilcox, 2014, p. 1108). This quarantine is most pronounced at lower levels of achievement. A higher-achieving student said that “In science, good writing deals with relating things, relating and describing processes” (Jeffery & Wilcox, 2014, p. 1109). This gets back to agency: By giving higher-achieving students more opportunities to do substantial, academic writing outside of the English classroom, teachers give these students more opportunities to see themselves as crucial and original constructors of knowledge. When we give lower-achieving kids no opportunities to do real writing in subjects other than English, we contribute to a diminishing of their agency (when they’re probably feeling less agentive to begin with! ): We tell them they ought to be mostly passive vessels through which facts should pass without getting messed up. Furthermore, when we don’t include real and meaningful writing across the curriculum (WAC) for students at all achievement levels, we fail to prepare students for college. Jeffery and Wilcox (2014) point out that “studies conducted in college settings have shown how students struggle to navigate variation in disciplinary expectations regarding source-based writing tasks” (p. 1111). As it stands, the onus of teaching students general rhetorical techniques tends to rest on the ELA teachers’ shoulders, and yet “research on college writers suggests it is students’ limited knowledge of how to argue and to support claims with evidence in a particular discipline–rather than their facility with general argumentative writing technique–that accounts for much of their struggle transitioning to college writing” (Jeffery & Wilcox, 2014, p. 1111). Recall that one of the premises of this research was that writing proficiency isn’t a fixed thing that is transferable across all occasions, disciplines, and tasks. We can’t simply teach kids how to write (in English class) and then expect them to write well in their demanding college science courses. Well, we can, and do, but it’s not working. But let’s also think past college. We need to acknowledge, and impart to our students, that “subject-area learning is not just about the reproduction of knowledge and information within the boundaries of the subject. . . . It is also about the production of knowledge and the making of personal meanings” (Green, 1988, p. 163). Our job is not to teach them literacy (as a body of skills) but to teach them to be literate (as a mechanism of interacting with a culture). They may not leave high school literate in all disciplines, but they should have some idea of how to go about becoming literate in whatever fields or communities they join. We need to emphasize that literacy is context-dependent, and that “it is never simply a case of being literate in and of itself but of being literate with regard to something, some aspect of knowledge or experience” (Green, 1988, p. 160). This is all very pie-in-the-sky, I know. We oughta, we oughta, we oughta. It’s also the same-old writing across the curriculum (WAC) debate. I believe that students should be writing across the curriculum, and I acknowledge that the “optics” of an English teacher demanding of the algebra teacher why she’s not teaching writing are not great. As Jeffery and Wilcox (2014) point out, “teachers will need far more support around writing instruction than they are currently receiving” (p. 1112). We can, and should, start slow. We can’t expect our first attempts to have students write in geometry, for example, to yield great results. We’ve spent years training students that to engage with math and science, for example, is to stay outside of it, keep their opinions to themselves, and not get their hands dirty. But the more we invite them to write in and about all courses, the better their writing, and thinking, will get. Teachers are likely to experience some discomfort as well. Jeffery and Wilcox (2014) recommend that “content-area teachers who have not received substantive training in literacy instruction may begin with the gradual introduction of ‘writing to learn’ approaches that are less formal and perhaps less daunting than extended, multiple draft assignments” (p. 1112). But I’d like to go one step further, and maybe this will assuage some of those math and science teachers who balk at an English teacher pushing writing in “their” courses. I’d like to expand the role of the teachers who are comfortable and masterful in teaching writing. Even as we push for writing across the curriculum (WAC) as described above, I’d like to see (and teach!) a required class that I envision as CAW: Content Area Writing. Other names are possible, but let’s play with CAW for a moment. In this dream class, a master teacher of writing would support students as they worked on individual writing assignments conceived or assigned in other classes. It would work almost like a thesis committee, in that students would come to CAW class working on an extensive piece of writing for some other class (biology for example). The biology teacher would serve as the content committee member while the CAW teacher, meeting frequently with the student writer as well as the subject area teacher in conference, guides the student through research, drafting, mechanics, revision, and presentation. Students in the class could have choice in terms of what course they want to use to develop their CAW project or, over the course of a year, students could work on a writing for each of their courses (English would remain a class separate from CAW). Although my initial design for this class entailed its being a senior course, the study I read encouraged me to rethink it as a freshman course, to start giving students subject-specific literacy in their most developmental years. What students from this study enjoyed most about writing was feeling like they mattered in it–they were implicated, involved. People who don’t teach teenagers every day love to tell me how apathetic kids are these days, how lazy and unoriginal they are. My own experience contradicts that opinion, as does this study. In short, if we don’t ask students to write–really write–about the subjects we’re teaching them, we’re not allowing them to truly engage in the material. in fact, we’re keeping them from learning. Gee, J.P. (2011). An introduction to discourse analysis: Theory and method (3rd edition). New York, NY: Routledge. Souto-Manning, M. (2014). Critical for whom? Theoretical and methodological dilemmas in critical approaches to language research. In D. Paris and M. Winn (Eds. ), Humanizing research: Decolonizing qualitative inquiry with youth and communities (pp. 201-220). Los Angeles, CA: SAGE Publications.